Hi everyone! It’s time for the November My Favorite Things release replay! Today, the MFT design team is taking a fresh look at the most recent release. Most of the supplies I used for this project are linked in the list at the bottom of this post. I went for a clean and simple design to focus on the skiing bear. I started by creating the snow dust using the ink smooching technique (check a former tutorial HERE) with Distress inks. I didn’t press the paper in the ink but the ink (on acetate) to the paper. The ink smooching technique is super easy but as I only had to ink a little area, I had to mask the rest of the surface to keep it clear. Once it was dry, I lightly blended blue Distress ink over the background for more contrast. I stamped the sentiment to another white carstock, cut it on the diagonal and adhered it to the ink smooched panel using foam pads. 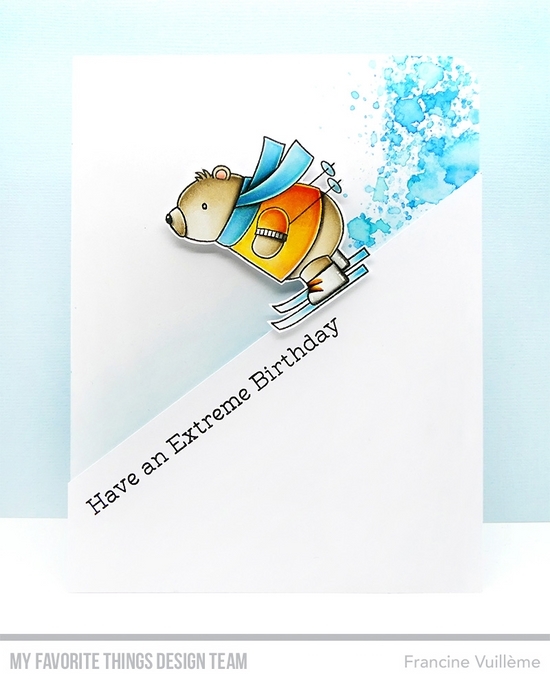 To finish off my card, I colored the skiing bear, cut it and fixed it to the card front with foam pads. 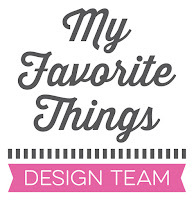 Be sure to check the MFT blog for more inspiration from the design team! what a fun card ! great ! Du hast aber auch immer tolle Ideen! Deine Karten stechen mir immer sofort ins Auge. Auch diese hier ist wieder superklasse geworden. I love the trail behind him!! Great card! Love how you got the ZOOM factor in your one layer card! This card is adorable! Can't wait to give one like this a try!!! I am in love.... with this card! I knew this was your card on the MFT blog...such a fun CAS design and your details are fabulous, Francine! Beautiful Copic coloring, too...as always! Awesome card !! Illustrating the snow dust with ink smooching is just a brilliant idea !